The Plankenburg and Eerste Rivers (Western Cape) have been reported to be contaminated with faecal coliforms. Water is drawn from both rivers for irrigation of fresh produce. The potential risk in the use of these rivers as irrigation sources was assessed by determining the fluctuations of 'indicator' and 'index' microbes over 3 years. Selected physico-chemical (water temperature, pH, COD, conductivity and alkalinity) and microbiological parameters, including coliforms, faecal coliforms, Escherichia coli and enterococci, as 'indicators' of faecal pollution, and Salmonella, Listeria and Staphylococcus, as 'index' of the presence of potential pathogens, were monitored. No correlation was found between water temperature and COD (r2 = 0.0003), whereas for temperature and pH a significant trend (p = 0.0004), but low correlation (r2 = 0.108), was observed. With the exception of the faecal coliforms (E. coli), no significant trends and no correlations between temperature and the dependent variables were found. For the faecal coliforms there was a significant trend (p = 0.0289) with temperature but not a good correlation (r2 = 0.0434), but the impact of temperature over time was significant (p = 0.0047). This is important, when the World Health Organisation (WHO) and South African Department of Water Affairs (DWA) guidelines for faecal coliforms are applied, as it indicates that temperature does impact the faecal coliform numbers. The presence of indicator organisms did not only indicate unsanitary conditions, but also the presence of potential pathogens such as Staphylococcus, Klebsiella, Listeria and Salmonella. Based on these results the microbial quality of these rivers was found to be unacceptable and does not meet the WHO and DWA guidelines for safe irrigation. There was also a high risk of exposure to human pathogens when water from these rivers is used to irrigate produce that is consumed without further processing. Many South African rivers have been found to be unsuitable for irrigation of fresh produce, mainly because of the high levels of faecal contamination. In all the reports published to date (Barnes and Taylor, 2004; Germs et al., 2004; Griesel and Jagals, 2002; Olaniran et al., 2009; Paulse et al., 2009), it was found that faecal indicator organisms exceeded the South African Department of Water Affairs (DWA) and World Health Organisation (WHO) guideline limits of 1 000 E. coli per 100 mℓ water for irrigation of fresh produce (DWAF, 1996; WHO, 1989). The Plankenburg River has specifically been reported (Barnes and Taylor, 2004) to be highly contaminated with faecal coliforms, with counts of up to 12 x 106 E. coli per 100 mℓ. From June 2004 to June 2005, faecal coliform counts as high as 3.6 x 106E. coli per 100 mℓ were reported by Paulse et al. (2009) for the Plankenburg River. The Plankenburg and Eerste Rivers pass through the town of Stellenbosch and are both used upstream and downstream of the town for irrigation of fruit and vegetables during the summer months. This is mainly because the water from the river is readily available and easily accessible. Fresh produce is recommended as part of a healthy diet to help prevent illnesses such as cardiovascular diseases. However, there is increasing evidence that consumption of fresh produce can be a major contributing factor to human gastrointestinal illness due to the potential for contamination with pathogenic microbes. Several studies have linked fresh produce foodborne outbreaks to polluted irrigation water as the major source of contamination (Pachepsky et al., 2011). According to Warriner and co-workers (Warriner et al., 2009) the presence and types of waterborne pathogens carried over to fresh produce vary greatly and can include a wide range of bacteria, protozoa and viruses. This sort of carryover has been reported to be high, especially in developing countries (Pachepsky et al., 2011). The scarcity of the water resources in South Africa, and the increasing evidence of pollution of the rivers, leaves little doubt that more attention needs to be paid to the types, fate and carryover potential of pathogens in waters that are utilised for irrigation of produce that will be consumed without any further processing steps. On a national level, little is known about the level of pollution, and specifically faecal contamination, of South African rivers that are tapped for irrigation purposes. To get a clearer understanding of the problem, a national study was initiated in 2007 by the South African Water Research Commission (WRC, 2008) to determine the extent of the microbial contamination of South African rivers that are used for irrigation. If DWA and WHO guidelines are applied to the data from previous short-term studies it must be concluded that the water from these rivers is unsuitable for irrigation of produce, especially that which will be consumed with minimal processing. In order to establish a credible database of the long-term variations in the microbial quality of the Plankenburg and Eerste rivers, sites on these two economically important rivers were monitored over a longer period. This would also give a clear indication of the impact of different seasons on both the microbial types present and the levels as well as variations in chemical composition that could impact microbial loads. 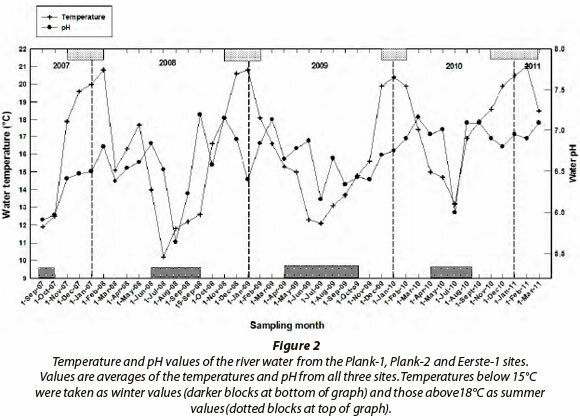 The objective of this study was to assess pollution levels in the Plankenburg and Eerste rivers and the fluctuations of the indicator and index microbes over a 3-year period. The first sampling site on the Plankenburg River (Stellenbosch region of the Western Cape) is located just below the Kayamandi informal settlement (Fig. 1) and is referred as to the Plank-1 site. The second site (Plank-2) on this river is 1.5 km downstream from the first site and at the confluence point between the Plankenburg and Eerste Rivers. Local farmers use this section as an irrigation source point, to draw water for irrigation further down the river. The fresh produce irrigated includes grapes, citrus fruit, pears, lettuce and green beans. The third site (Eerste-1) was on the Eerste River (Jonkershoek River section) about 400 m before the Plankenburg River merges to form the main stem of the Eerste River. This river originates in the Jonkershoek Mountains, runs through small-scale farming areas where it is used for irrigation and aquaculture purposes and then passes through the Stellenbosch residential areas before it reaches the confluence point. A fourth sampling site (Plank-0) was selected about 5 km upstream from the Plank-1 site, specifically to assess the impact of an informal settlement and an industrial area on the water quality of the Plankenburg River. However, for large parts of each year, and especially during the dry summer months, this site had no flowing water and thus was not sampled with the same frequency as the other sites. Both rivers were sampled once a month for 42 months (September 2007 to March 2011). The sampling was done on Mondays between 08:00 and 08:30, according to the SANS 5667-6 (SANS, 2006) guideline. The samples were transported on ice and analysed in duplicate. The aerobic colony count (ACC) was used to give an indication of the size of the microbial population in the water. The aerobic and anaerobic spore formers were used to establish the presence of Bacillus and Clostridium strains. Total coliforms, faecal coliforms, E. coli and intestinal enterococci were used as indicator organisms for faecal contamination (Busta et al., 2003). The index organisms (Staphylococcus, Salmonella and Listeria) were used as indicators of the possible presence of related pathogens, i.e., Clostridium, Campylobacter, Giardia, Cryptosporidium, and other Gram-negative species (Busta et al., 2003). The aerobic colony counts were determined according to the SANS method 4833 (SANS, 2007). Results are reported as cfu∙mℓ-1 of sample. The spore formers were determined using the method of Austin (1998) by preparing a dilution series of the sampled water in PSS (physiological salt solution) and placing them in a 75°C water bath for 20 min (Austin, 1998). Trypticase soy agar (Merck) plates were both aerobically and anaerobically incubated at 35°C for 48 h. Data was reported as cfu∙mℓ-1 of sample (Merck, 2007). Staphylococci were enumerated according to the SANS 6888-1 method (SANS, 2000) using Baird-Parker agar (Merck). Typical colonies were identified as black with a clear zone and the data reported as cfu∙mℓ-1 of sample (Merck, 2007), with atypical colonies being dark brown, greyish or black colonies. The identities of typical colonies were confirmed using the API Staph test kit (Biomerieux, South Africa). The pre-enrichment, enrichment and confirmation steps required for the detection of Salmonella species were conducted as described in the SANS 6579 method (SANS, 2003). Typical colonies were identified as black and the presence of Salmonella reported as either present or absent (Merck, 2007). Typical colonies were confirmed on Salmonella chromogenic medium (Oxoid, Hampshire, England). The detection of Listeria monocytogenes was according to SANS method 11290-1 (SANS, 2001), which requires both a primary and secondary enrichment step and streaking onto Oxford agar (Merck) and Palcam agar (Merck) plates. Typical colonies were identified as grey-green with a black zone, and the presence of Listeria reported as either present or absent (Merck, 2007). Colonies were further characterised and identified using the specific API kit (Biomerieux, South Africa). A 0.45 µm membrane filter was used to filter 100 mℓ of sample according to the SANS 7899-2 method (SANS, 2004), the filter placed on Slanetz & Bartley plates (Merck) and incubated at 35°C for 44 h. The filter was then placed on Bile Esculin Azide plates and incubated at 44°C for 2 h. Typical colonies were black and the data reported as cfu∙100 mℓ-1 of sample (Merck, 2007). Colonies were identified using the specific API kit (Biomerieux, South Africa). Detection in river water was done using the multiple tube fermentation (MTF) method (Cristensen et al., 2002) and Standard Methods (APHA, 1998). Numbers were determined using the Most Probable Number (MPN) tables. For confirmation of the presence of E. coli, positive faecal coliform tubes were streaked on Levine eosin methylene blue (L-EMB) plates (Merck). Colonies that had a metallic green sheen were considered positive for E. coli (Merck, 2007). Colonies were identified using the API 20 E kit (Biomerieux, South Africa). The dilution factor of the positive faecal coliform broth tubes that resulted in typical colonies was used to determine the E. coli count from the MPN tables (APHA, 1998). The MTF results were expressed as coliforms, faecal coliforms and E. coli MPN∙100 mℓ-1. Results obtained during the study indicated that various hurdles, such as enrichment steps, incubation temperatures and selective differential media, which form part of the standard identification methods for the detection of specific organisms, sometimes failed to exclude unwanted organisms. As a result, many non-typical colonies were obtained on the final evaluation medium that did not resemble the typical colony characteristics recommended in the standard methods. All colonies obtained from the various selective media, whether they resembled typical colony characteristics or not, were subjected to further testing to establish their identity. Characteristics of purified isolates were subjected to Gram-staining, cell and colony morphology, catalase and oxidase and characterisation with specific API test kits (Biomerieux). These included the API Staph; API 20 Strep; API 20E and NE; API 50 CHB and the API Listeria kits, each performed according to the specific API instruction manual (BioMerieux, F-69280 Marcy l'Etoile, France). Only API results with a >95% identification (classified as 'good', 'very good' and 'excellent') were regarded as positive identifications. The parameters that were monitored according to Standard Methods (APHA, 1998) included water temperature and pH at site, alkalinity, conductivity and chemical oxygen demand (COD). Conductivity (mS∙m-1) was determined using a Hanna Instruments (HI8733) conductivity meter. A DR2000 spectro-photometer (Hach Co. Loveland, CO) was used to colourimet-rically determine the COD and data expressed as mg O2∙ℓ-1. Relationship between temperature and other parameters was investigated by doing regressions with temperature as independent predictor and ACC, COD, pH, faecal coliforms (E. coli) and coliforms as dependent predictor variables. The resulting regression coefficients quantified the type of association between the predictor and respective dependent variable. As this was a time-series data set, the Durbin-Watson (d) test was done to determine the serial correlation for all the above parameters. This value must be near 2, which would then indicate that there is no serial correlation. Additionally a TSCREG (time-series cross-sectional regression) was done. Results are interpreted as a normal regression. A p value of <0.05 was considered statistically significant. The environmental and chemical data obtained during the research period (September 2007 - March 2011) for each of the three sites, are summarised in Table 1. The temperature data for water from the three sites were similar and ranged from 9.9°C to 21.8°C with the lower values found during the colder winter months (<15°C: May to October) and the highest in the summer months (>18°C: December to February), as indicated in Fig. 2. The pH ranged from 5.63 to 7.24 with values mostly above 6.0, on average. These values are within DWA's Target Water Quality Range (TWQR) of pH 6.0 to 9.0 (DWAF, 1996). Conductivity ranged from 2 to 11 mS∙m-1 and is within DWA's TWQR of 0 to 70 mS∙m-1 (DWAF, 1996). Alkalinity ranged from 13 to 1 125 mℓ-1 CaCO3 and COD from zero to 296 mg∙ℓ-1. The higher alkalinity values were mostly found at the Plank-1 site where values of above 100 were regularly recorded. Since this site is just below the Kayamandi informal settlement and the Plankenbrug industrial area the fluctuations could be caused by nutrient cycling or effluent discharges. Overall it was concluded that according to physico-chemical DWA guidelines the Plankenburg and Eerste River water will have no adverse effect on crop yield and, based on this, the water can be used for irrigation of fresh produce. The ACC results for the three sites are presented in Fig. 3 and ranged from <log 1.69 to >log 6.88 cfu∙mℓ-1 of water. This wide variation in ACC values has also been previously reported for the Plankenburg River (Barnes, 2003; Paulse et al., 2009) and for the Baynespruit River in KwaZulu-Natal (Gemmell and Schmidt, 2012). On average the Eerste-1 site gave lower counts than was found for the other two sites, which gave similar counts to each other. It is interesting to note that visually the ACC counts during the winter months did not appear to be lower on account of the lower temperatures. The ACC data is generally taken as representative of the total microbial content including spoilage microorganism (Sela and Fallik, 2009). However, DWA guidelines only give values for the hetero-trophic bacterial counts, recommending a value of less than log 2.0 cfu per mℓ for safe domestic use. The highest count for the aerobic spore formers was log 4.35 cfu∙mℓ-1, recorded in December 2009 for the Plank-1 site. This is a clear indication that aerobic spore formers, such as members of the Bacillus genus, were present at times in the water. The count for the anaerobic spore formers ranged from log 1.71 to log 4.08 cfu∙mℓ-1 and it was concluded that anaerobic spore formers of the Clostridium genus were present in the water. Although not all endospore formers are human pathogens, both B. cereus and C. botulinum are important foodborne pathogens (Harris et al., 2003; Kim et al., 2006; Kim et al., 2010), and if irrigation water contained these it could lead to colonisation and formation of biofilms on the surface of fresh produce (Niemera and Cooke, 2010 ). This could possibly result in disease outbreaks or faster spoilage of the fresh produce and even blowing of improperly canned vegetables. The highest count for staphylococci was log 2.63 cfu∙mℓ-1, recorded in April 2010. The percentage of positive samples found in the water from the three sites is given in Table 2. Typical colonies on the Baird-Parker plates were identified as round black colonies with a clear zone (Merck, 2007). The data could also be an indication that enterotoxin-producing Staphylococcus aureus strains that can cause food poisoning may be present in the water (Cha et al., 2006). The intestinal enterococci count ranged from log 1.49 to log 3.24 cfu∙mℓ-1 and for all three sites >74% of samples were positive for intestinal enterococci (Table 2). Enterococcus faecalis strains are generally used as indicators of faecal contamination (Agudelo et al., 2010) and thus the presence of intestinal enterococci was taken as an additional indicator of faecal contamination of the water from these rivers. 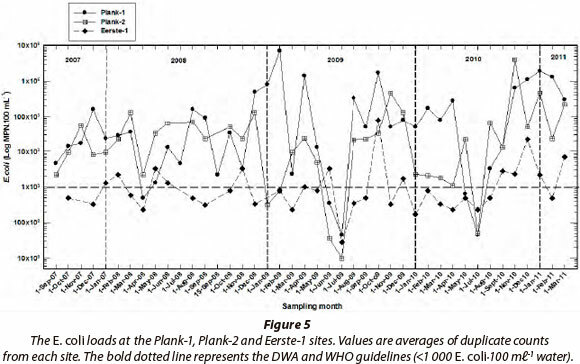 Salmonella and Listeria were present in the water of >50% and >39% of the Plank-1 and 2 and Eerste-1 samples (Table 2), respectively, over the 42-month sampling period. Both pathogens are considered as food safety hazards (Mead et al., 1999). The presence of Salmonella in the water also confirms faecal contamination as a source of pollution, as this pathogen generally occurs in faecal matter of warm-blooded animals or infected humans (Renter et al., 2006). The high Salmonella incidence could pose a health threat since some residences in the surrounding areas draw water from the Plankenburg and Eerste rivers for gardening and household purposes. Therefore, contact with the water could lead to a serious health hazard. The high incidence of index organisms suggests the possible survival and build-up of related foodborne pathogens resulting from continuous faecal contamination of the river. Thus, regular monitoring of river systems is critical in preventing possible disease outbreaks since members of the genus Salmonella are food pathogens that have been associated with many disease outbreaks (Newell et al., 2010). This is a clear indication that the survival of pathogens is possible in flowing streams. Therefore continuous faecal contamination of the river water may lead to a possible build-up of related disease-causing foodborne pathogens in the water. 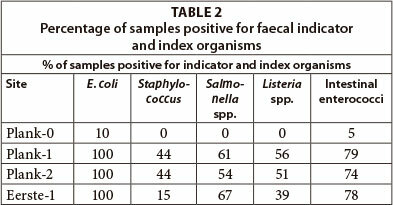 The coliform counts for all three sites shown in Fig. 4 ranged from log 2.518 to 6.845 MPN∙100 mℓ-1 and the faecal coliform (E. coli) counts (Fig. 5) ranged from zero to log 6.845 MPN∙100 ml-1. At the start of the study it was expected that seasonal changes would impact the microbial loads, with much lower numbers present found during the colder and rainy winter months. However, it was concluded from the graphs that there is no relationship between the coliform and faecal coliform (E. coli) counts and the water temperature or the water pH. The data show that higher microbial counts (>log 5) were found both in the summer and winter months. It could be that the higher flow rates associated with heavy rainfall during the winter months could have led to higher coliform counts because of increased run-off from the informal settlement or re-suspension of bacteria from the river sediments (Dukta and Kwan, 1980). 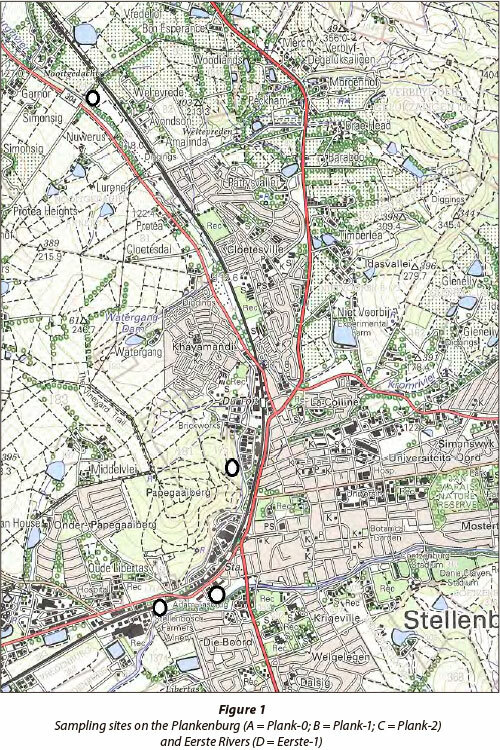 Ackermann (2010) reported a high faecal coliform count of log 5.204 MPN∙100 mℓ-1 for the Plank-1 site in early August 2008, following heavy rainfall at the end of July 2008. Therefore rainfall and river flow rates may impact the faecal coliform load through dilution and re-suspension, resulting in the large count variation profiles shown in Fig. 4. When the results for the Plank-1 site are compared with those from the Plank-2 site, which is about 1.5 km downstream, no direct relationship is visible. One would have expected that the Plank-2 loads would have been much lower due to dilution, bacterial decay or even settling between Plank-1 and Plank-2. It must also be taken into consideration that coliforms have been shown to survive and possibly multiply for a period of several days in a flowing stream (Dukta and Kwan, 1980). It is also possible that there is another contamination source between the two sites. However, the data do suggest that there is a continuous source of contamination from the informal settlement and possibly from the industrial area. The results for Eerste-1 (Figs. 4 and 5) showed lower coliform and faecal coliform (E. coli) loads than that found for the two Plankenburg sites. The coliform and faecal coliform counts varied from a low log 2.361 to 4.897 MPN∙100 mℓ-1 water. The water from this site does not pass an informal settlement or a large industrial area but does pass through a farming area and then through the town of Stellenbosch. Although the coliform counts were lower in the Eerste-1 samples compared to those in the Plank-1 and 2 samples, in a number of cases (35%) they still exceeded the DWA and WHO guidelines of <1 000 faecal coliform∙100 mℓ-1 for the safe use of water for irrigation. It was therefore concluded that the Eerste River could still pose a health and food safety hazard if used for irrigation of fresh produce intended to be consumed raw. 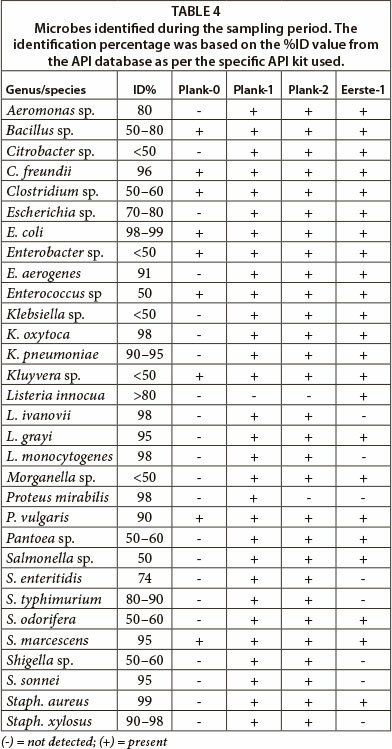 The faecal coliforms dilutions were all confirmed as containing typical E. coli (Table 1) on L-EMB plates (Merck, 2007). Therefore the maximum E. coli count was also considered to be log 6.845 MPN∙100 mℓ-1 of water (Fig. 5). When applying the DWA and WHO guideline of <1 000 faecal coliform∙100 ml, irrigation water, both rivers can be considered as unsuitable for irrigation of fresh produce intended to be consumed raw (DWAF, 1996; WHO, 1989). 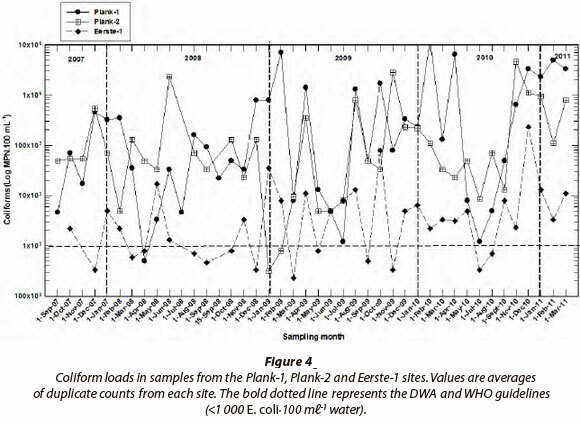 The high E. coli counts also suggest high faecal contamination of the water at both of the Plankenburg sampling sites (Plank-1 and 2), as the presence E. coli is indicative of animal or human faecal pollution sources (Busta et al., 2003). This is consistent with the results of previous studies (Barnes and Taylor, 2004; Lötter, 2010; Paulse et al., 2009). Since the Plank-0 site showed no or very low E. coli numbers it was concluded that the nearby informal settlement and/ or local industries may possibly have been the main sources of the pollution. When considering this study's maximum faecal coliform loads, there appears to have been a general decrease in the faecal contamination of the Plankenburg River over time, as Barnes and Taylor (2004) reported a maximum E. coli count of log 7.0792 MPN∙100 mℓ-1 for the Plank-1 site in 2000. Similarly, for the year 2005, Paulse et al. (2009) reported an E. coli count of log 6.5563 MPN∙100 mℓ-1 at the same sampling site, and in 2007 Lötter (2010) reported a maximum E. coli count in February 2009 of log 6.845 MPN∙100 mℓ-1 for the same site. This general decrease in E. coli could be because of dilution factors, lack of suitable carbon sources, accelerated decay rates, biofilm formation or even the settling and retention of organisms in the sediment, as has been shown to be possible in flowing streams (Dukta and Kwan, 1980). Furthermore, the decrease in E. coli could also be due to a decrease in contamination from the nearby informal settlement. Though the overall counts for the period September 2007 to March 2011, as determined in this study, are lower than that reported in previous studies (Barnes and Taylor, 2004; Paulse et al., 2009), when considering the DWA and WHO guidelines the water should not be used for irrigation of fresh produce. The presence of E. coli in the water could pose a health and food safety hazard if the water is used to irrigate fresh produce intended to be consumed raw, since pathogens are known to have the ability to attach to plant tissue (Solomon and Sharma, 2009). The regression summary is given in Table 3. For the environmental parameters there was no correlation between water temperature and COD (r2 = 0.0003) and for the pH a significant trend (p = 0.0004) but only a low correlation (r2 = 0.108) was found. For the microbiological parameters, with the exception of the faecal coliforms (E. coli), no significant trends and no correlations between temperature and the dependent variables were found. For the faecal coliforms there was a significant trend (p = 0.0289) but not a good correlation (r2 = 0.0434). As the results for the rivers formed a time-series data set, the Durbin-Watson (d) test was done to determine the serial correlation for all the above parameters. Values below 2 indicate that there is a serial correlation with one exception (COD). Therefore a time series cross-sectional regression (TSCSREG) was done. All of the variables (Table 3) showed a weak correlation but the impact of temperature over time on the faecal coliforms (E. coli) was significant (p = 0.0047). This is an important finding, especially when the WHO and DWA guidelines for faecal coliforms (E. coli) are applied, as it indicates that temperature, even at temperatures much lower than the 37°C required for optimum growth, does impact on the count. Table 4 gives a list of other microbes isolated and identified from the three main sampling sites during the sampling period. 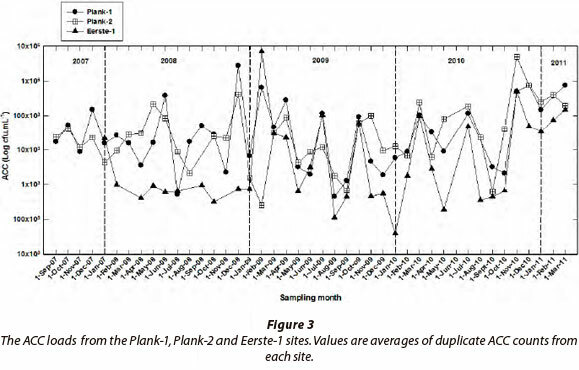 The lower pollution level of site Plank-0 in comparison to the extremely polluted Plank-1 and 2 sites could again be seen, with several potential pathogenic organisms detected at Plank-1 and 2, but absent at Plank-0. Fewer organisms isolated from site Eerste-1 also suggested a better water quality at this site in contrast to the poor water quality of the Plank-1 and 2 sites. Most importantly, however, the isolates did not only include faecal indicators such as faecal coliforms, E. coli and ente-rococci, but, among the index organisms, also potential pathogens such as Klebsiella pneumoniae, Listeria monocytogenes, Salmonella and Staphylococcus aureus. The presence of such index organisms in river water is disturbing, as most, if not all, have been implicated in both waterborne and foodborne outbreaks in the past (Wilkes et al., 2009). It can therefore again be concluded that the water quality from these sites is of unacceptable microbiological quality and could potentially present a threat to the health of any person or animal that is exposed to it. While it was not within the scope of this study to detect and identify all of the microorganisms present in the river water samples, it can be seen from the results that microorganisms - and potential pathogens - other than those that were tested for, were present. This highlights the importance and function of indicator and index organisms, as the levels that they are present in reflect the state of contamination of river water, without it being necessary to test the water for each microbial genus or species. The high aerobic colony, total coliform and faecal coliform counts for both the Plankenburg and Eerste River sites indicate a continuously high level of microbial contamination. The presence of the indicator E. coli in all of the water samples evaluated, and the presence of intestinal enterococci, confirms the type of pollution as being faecal. It was thus concluded that the water from these two rivers does not meet the WHO and DWA guidelines for safe irrigation (DWAF, 1996; WHO, 1989). The much lower pollution level of the Plank-0 site in comparison to the extremely polluted Plank-1 and 2 sites is striking. As Plank-1 and 2 are downstream of an informal settlement and an industrial area, and since the upstream Plank-0 site showed no or very low E. coli numbers and no potential pathogenic organisms, it was concluded that the nearby informal settlement and/or local industries could be the main sources of the pollution. The high incidence of the index organisms (Salmonella, Staphylococcus and Listeria) confirms the presence of other related enteric pathogens. The enumeration of aerobic and anaerobic endospore formers also suggests the presence of other known foodborne pathogens and general spoilage organisms from the genera Bacillus and Clostridium. The data from this study clearly shows that the two sites on the Plankenburg River were more polluted than the site on the Eerste River. Intestinal enterococci loads were also higher for these two sites than for the Eerste River site. It was also interesting to note that Staphylococcus numbers were much lower for the Eerste River in comparison to the numbers present in the Plankenburg sites. Therefore there is a possibility that enteric pathogens that may cause disease outbreaks can be transferred to crops through irrigation. The data showed a lot of variation which suggests that there is a possibility that the water is not always highly contaminated. This also means that there is a possibility that during a particular month the river may have low E. coli loads that are within the guidelines, making the river water suitable for irrigation of fresh produce intended to be consumed raw. The question of whether temperature has a direct impact on the microbial counts has always been of interest. Temperature is a very important variable, especially for the setting of guidelines, because a particular set of monitoring data may represent an overestimate or underestimate of the actual contamination level, due to the impact of temperature on the survival and growth of microbial organisms. The change in weather conditions, which in turn affects the water temperature, was at the beginning of this study suspected to be the main cause of the variation in microbial loads. However, this was not found to be the case, as the regression analysis showed no correlation (p < 0.05) between the microbial (total coliforms and E. coli) and physico-chemical variables (water temperature and pH). However, the TSCREG showed a weak correlation, and the serial impact of temperature over time on the faecal coliforms and specifically the E. coli was shown to be significant (p = 0.047). It was thus concluded that temperature, as measured during this study, could have had an impact on the faecal organisms. However, no experiments were done to show what the survival and growth of the faecal microbes would be at different temperatures. Therefore growth kinetics studies should be done to extensively investigate the impact of temperature and other physico-chemical variables on the survival and growth of faecal organisms in rivers. Another important aspect that needs to be addressed is the extent to which carry-over of contaminants can occur when polluted irrigation water is applied to fresh produce. This study was part of an on-going solicited research project (K5/1773) funded by the Water Research Commission and co-funded with the Department of Agriculture, Forestry and Fisheries. Financial support provided by the National Research Foundation (IFR2008112100010) in the form of postgraduate bursaries is gratefully acknowledged. The authors would also like to thank Dr Gerhard Backeberg of the Water Research Commission for his valuable support, as well as the many farmers who allowed sampling on their premises.